Our USDA All-Natural Pekin Duck Livers are the base ingredient for Duck Liver Pate, Duck Liver Parfait, Duck Liver Mouse, and more. Hand cut on the day of harvest. Duck Liver There are 7 products. 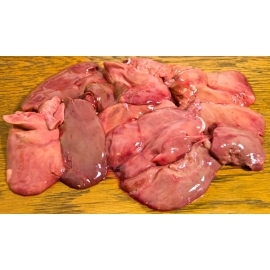 Duck Livers - Fresh - 2 lbs. Small bag of fresh Duck Livers. Poly-packed and with a net weight of at least 2 pounds. Shipped fresh on the day of harvest. 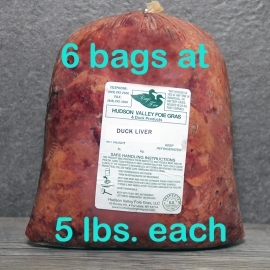 Duck Livers - Frozen - 5 lbs. Poly-packed and frozen on the day of harvest. The net weight is at least 5 pounds. Duck Livers - Fresh - 5 lbs. Poly-packed and shipped fresh on the day of harvest. The net weight is at least 5 pounds. Duck Livers - Frozen - 10 lbs. Poly-packed and frozen on the day of harvest. The net weight is at least 10 pounds. This is a full case of fresh Duck Livers. The net weight is at least 30 pounds, packed in six 5-pound bags. Shipped fresh on the day of harvest.